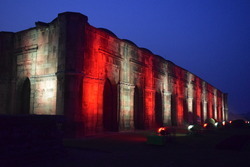 Exporter of a wide range of products which include architectural lighting. Canara Lighting Industries Pvt. Ltd., is the India’s biggest Manufacturer of specialized Architectural Lighting for the last 40 years in India - Karnataka. In the architectural Lighting field, Canara focuses on three fundamental aspects of the illumination of buildings or spaces. Canara Lighting develops the lighting concepts with their own manufactured lights having power efficient most advanced LED Lights and a digital controlling mechanism to achieve the perfection in the design concept.